Late 17th/early 18th century with substantial alterations and additions. 2-storey and attic; 3-bay; terraced tenement block with ground floor shopfront to principal (N) elevation and crowstepped gable to E side. Coursed painted stone to principal elevation; harled elsewhere; sandstone ashlar dressings. Architraved windows above ground floor. Moulded cornice to principal elevation. N (PRINCIPAL) ELEVATION: late 20th century glazed shopfront to ground floor. Shop entrance with rectangular fanlight to outer left. Vennel entrance to outer right; bracketed timber fascia board above. 3 regularly-disposed windows to 1st floor; 2 former catslide dormers (now blocked) above. S ELEVATION: later lower-height extension extends across most of elevation. Vennel entry to left. Small window with slightly chamfered architrave above; larger window above. Mainly 4-pane timber sash and case windows. 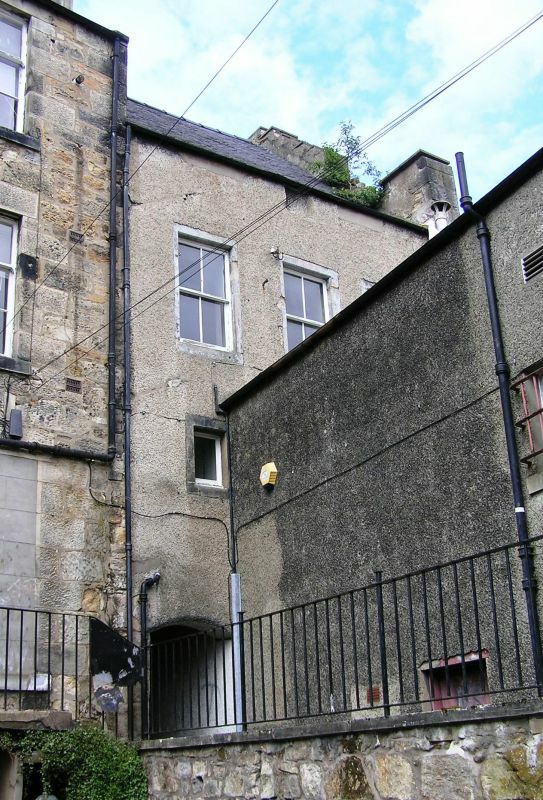 A much altered early building situated on Dunfermline's historic high street. The steep roof pitch, crowstepped gable and remains of catslide dormers are indicative of a late 17th century date. The building has been altered to increase the size of the 1st floor windows, probably in the early 19th century, and the shopfront in the late 20th century.